Modded r9 380 4gb and r9 380x, for all gpu brands that have elpida memory. Tested and tuned, so all you have to do is flash it and mine. This mod will give you a rough 10-15% increase in performance. 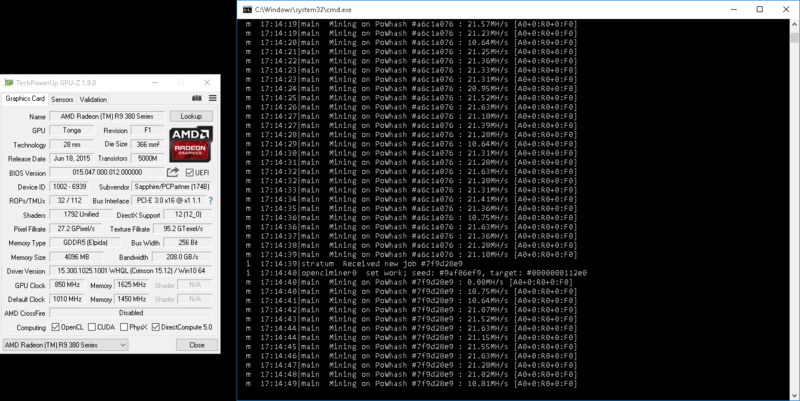 21-22 MH/s (stock) vs ~25 MH/s (Modded). While consuming ~150w from the wall. Currently, only available for r9 380 4gb and 380x. Yes, its easy to do. 4 clicks, and your card is mining much faster. And for the 2gb version of the r9 380? @bitcanuck is not samsung memory on msi 380 cards? I've seen some MSI 4gb have hynix AFR R0C chips. What chips on your overclocked at 1750 cards ? You have to mod it.. Without modding it, you will get 21-22mh. Thanks for posting this. I never would've thought to try 1750 (1625 was the highest I've tried before). I have a MSI R9 380 Gaming card that runs nicely at 1625 getting 23.5Mh/s. 1750 gives me 25.3! @bitcanuck does this require anything other than setting the numbers? are you overvolting somehow? Also have you tried this with underclocked core? I have my MSI gaming 380s set to core 800 mem 1500 and they hash about the same as stock core but at much lower power. As posted already on bitcointalk. 1750 mem is to high for 95% of the cards. As @bitcanuck said, he raised his mem to 1750 and gets that same hash rate. There is no rom mod needed to get that..
@Bitcanuck said it gave him boost of 2mh from 1625 to 1750 which is a lot. I read in another thread that he edited the bios with the tonga reader tool, so probably he increased the voltage to get this mem clocks stable. Anyhow, just tried it, raising mem to 1750, runs fine yeah, but i'm sure it will crash after a few hours.. I'll be doing a mod for 380 later this week, (timings), for free! <-- yeah! It's as simple as setting the memory clock, if you're lucky enough to have a card with fast RAM (in this case Samsung). My other MSI R9 380 cards (Armor 2X) aren't stable at 1625, so I run them at 1500. As for underclocking, I've been doing it for a while. If you search through some earlier threads you'll find one where @Heliox had to figuratively eat his hat because he wouldn't believe that you could underclock them without reducing the hashrate. But true none the less! Those Tonga's are quite interesting though. Will do A LOT of more testing on these, as well as bios mods. "definitely!" Now with tighter timings, speed is basically the same at the same clocks but avarage goes up by a mile, as you can see for yourself. Ok, guys this is not a spam field. I you want to talk to each other, please go to a different place. At 880/1625 you can get 23-23.5 on the 380 if your RAM is good. GDDR5 has parity for error detection, so when you push your RAM you start getting errors before seeing outright failures. Parity errors require re-transmits, which slows the effective hashrate. I suspect if you drop the clocks to 810/1500 you'll see almost the same hashrate. Tried with 800-810, wasn't any better.. also tried to raise it to 1750, speed was 23.5.. yeah.. obviously..
but again, card won't hold it..
WRONG. I upped my memory voltage to get 1650 stable. WRONG it's not possible to raise your memory voltage. You can however raise the voltage for the memory controller. But not the Memory itself. + didn't you tell me in pm you did something on the timings? You're actually right on that one. I misread. And I did. Sorry to bump this thread. Just wanted to find out if there was a modded bios out there for the 380... or if it is even worth messing with? I have 2 Sapphires (one with backplate with hynix vram, other older non-backplate with elpida). Both are 800/1500 with ~100mv less core voltage, hashing 21.1~. I used TongaBiosReader to do the bios changes, but I feel this program is confusing (2 voltage tables for core?) while at the same time limited, especially with the vram. So, do I leave it be with the 21.1mh/s, or am I missing out? How do you guys find out what vram mfg/brand such as hynix, elpida, etc is on your video card? And which one of these are the better ones?